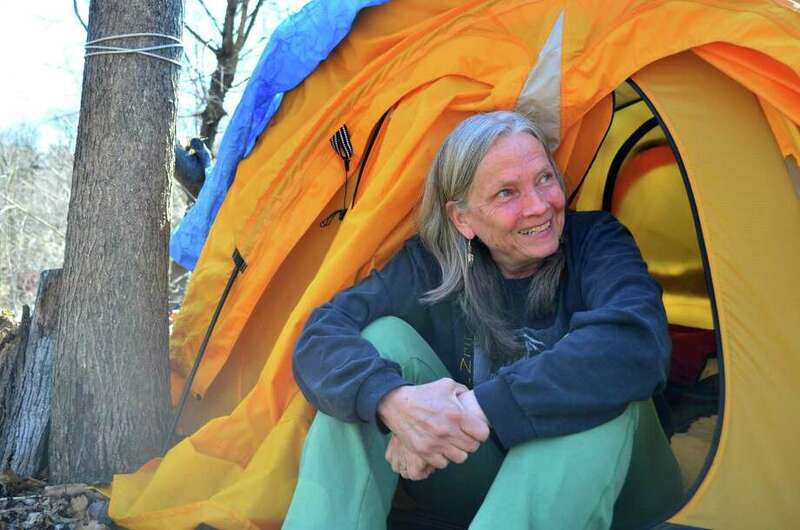 Nina Miller sits in the opening of her tent in this April 2014 file photo. Since June 26, 2013, Miller has slept in the tent for 205 nights. On June 26, 2013, I set up a two-person tent in my yard -- up a hill, 60 feet from my back door. I was determined, by sleeping out as many nights as possible during the following year, to see what sort of wildlife we have here now. I wanted to prove to myself and to others, especially children, that there is a lot of nature to admire, respect, love and protect right here in Darien. June 26 was my 205th night. Darien is 23.4 square miles -- 12.9 land and 10.6 water. Its latitude is 41 degrees, 4' 43" N, longitude is 73 degrees, 28' 11" W. Elevation is 52 feet. Our population is roughly 20,000 and we are 98.5 percent developed. My house sits on half an acre and is a two-minute walk from Route 1, a seven-minute walk from Interstate 95 and an 18-minute walk from the Metro-North train station. I am surrounded by five houses, close enough for Oakland A's right fielder Yoenis Cespedes to hit any of their chimneys with one of his amazing throws. Besides some cold and clear full-moon nights, sparkling sunrises and somnolent sunsets, I saw these animals in my back yard: deer, groundhogs, fox, rabbits, squirrels, chipmunks, garter snakes, red-backed salamanders, slugs, leopard frogs, peeper frogs, butterflies, dragonflies, damsel flies, bumblebees, moths, spiders, crickets, and katydids. Also, grackles, starlings, chickadees, cardinals, blue jays, turkeys, mourning doves, hummingbirds, titmice, robins, wrens, sparrows, juncos, finches, Baltimore orioles, red-winged blackbirds, cat birds, mocking birds, nuthatches, flickers, and woodpeckers, including the yellow-bellied sap sucker and a pileated woodpecker. I saw one raven in a tree by our driveway, identified by its loud, raspy call. Also appearing was a red-tailed hawk, a red-shouldered hawk and a sharp-shinned hawk, all usually seen somewhere in the vicinity of the bird feeders. I used to see bats, but don't anymore. Across Route 1, great blue herons wait for breakfast at the cemetery pond and geese and ducks have their babies there, too. Down the road at Gorham's Pond, egrets roost in trees and black-crowned night herons stand quietly while river otters slip by in the dark water, also looking for fish to eat. I hear osprey and seagulls call as I walk down my front steps. Finally, in the early morning hours of late winter, a great horned owl hooted his way through time, barely blinking, still as the branch he sat on in the skyscraper tall pine at my neighbor's house. He was probably looking for a mate, too, but for me, his plaintive call was a pleading request for all of us not to forget him and his friends in the wild as we live our lives among them. Nina Miller is a Darien resident.